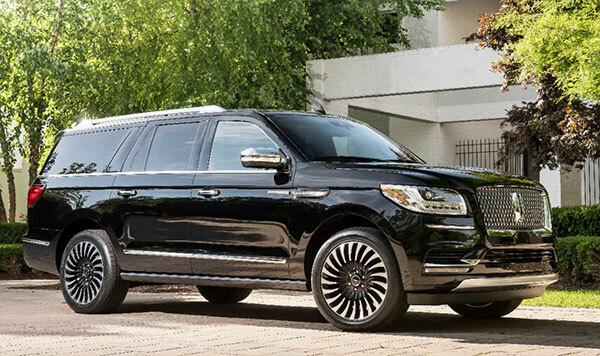 The Lincoln Navigator received a total redesign for the 2018 model year. The 2018 Navigator is bigger and heavier than before, more powerful, and way more luxurious. The new Navigator is unapologetically big, brash, and loaded with luxury features. Glamour has returned. As with the closely related, all-new Ford Expedition, the 2018 Lincoln Navigator is available in two lengths. The standard version rides on a 122.5-inch wheelbase and measures 210 inches long. The extended-length Navigator L sits on a 131.6-inch wheelbase and is 221.9 inches long. Long-body Navigators come in Select, Reserve, and Black Label trim. Rear-wheel drive is standard on Premiere and Select editions. All-wheel drive is standard on upper trim levels, and an option at the lower end. Bountiful glass area gives the Navigator better outward visibility than GM’s full-size SUVs. Parking can be a tad challenging, because of the perpendicular front end. Upper trim levels can be fitted with plenty of safety technology, but mainly in option groups. A safety package for Reserve trim includes forward-collision warning with automatic emergency braking, adaptive cruise control, automatic high beams, lane-departure warning, active parking assist, and a head-up display. Such safety features are standard on Black Label models. All Navigators get a rearview camera. Surround-view cameras are available for all except the Premiere. Premiere 4×4 ($74,710) has all-wheel drive. The Navigator Select ($76,055) model gets 22-inch wheels, cooled front seats, surround-view cameras, illuminated power running boards, a heated steering wheel, and wireless smartphone charging pad. Select comes in Navigator L ($80,750), 4×4 ($78,710), and 4×4 L ($83,405) versions. Navigator Reserve 4×4 ($81,205) and Navigator L Reserve ($84,405) have all-wheel drive, 22-inch wheels, a panoramic roof, second-row console, and heated/ventilated front seats. Black Label 4×4 ($93,705) includes distinctive 21-spoke 22-inch wheels, CD player, 20-speaker audio, trailer tow package, and Technology safety pack. Three interior themes are offered: Chalet (snowy white), woodsy Destination, or vintage-blue/white Yacht Club. Black Label is available in the extended L ($96,905) version, also. While sharing its basic profile with the Ford Expedition, Lincoln’s exuberant SUV differs sharply in body styling. A tall front end conveys a sense of drama, far beyond the previous model. Hints of current Land Rovers can be seen in the no-pillar bodysides. Large headlights sit alongside an inset mesh grille. Upper models get LEDs. Body creases and corners recall Lincolns from the company’s past. Large taillamps stretch across the rear, while swirled-design wheels impart their own dramatic aura. So do the long chromed fender vents. Spacious and lavish, the Navigator cabin approaches the spectacular. Glossy wood panels and a flurry of chrome trim attract the eye, while high-resolution display screens emphasize the practical. Seating seven (eight with a second-row bench), the Navigator promises luxurious comfort and an isolating experience. Thick sound-damping materials help keep the cabin quietly tranquil. Separating the wide, wide horizontal dashboard is a console that looks almost like furniture. High-definition displays dazzle the senses. A 12-inch screen with an excellent interface substitutes for conventional gauges. The infotainment system is less intrusive than those in many luxury vehicles. Apple CarPlay and Android Auto connectivity are standard. Immense doors open wide for easy entry/exit. Power running boards also help. Even the base model’s front seats are softly supportive, with just-right flexibility. Optional 30-way power seats provide exceptional comfort, with lower back and shoulder adjustments. Second-row captain’s chairs should please larger passengers. Lower-end models can substitute a three-person bench that slides to ease third-row access. Six-foot-tall riders can fit into the third-row seats, enjoying a fair amount of legroom, though head space could be slightly limited. With all seatbacks upright, cargo volume totals 19.3 cubic feet in the regular model, or 34.3 in the extended-length L version. Folding down second and third rows expands space to 103.3 or 120.2 cubic feet, respectively. A power-folding third-row seat and power tailgate are standard. Though gargantuan in dimensions, the Navigator defies some typical big-SUV expectations. For instance, developers sought road behavior approaching that of a mature sedan. Ride/handling qualities reach well past GM’s biggest SUVs, imparting a lighter feel. In the fully independent suspension, adaptive dampers can subdue most harsh road surfaces, despite the 22-inch wheels on most models. Size isn’t as much of an obstacle as expected. Adaptive electronic steering delivers some light driver feedback, while coping with massive wheels and a turning circle that exceeds 40 feet. Lincoln has modified Ford’s terrain-management system to improve traction control. Emitting a throbbing sensation, Lincoln’s version of the corporate twin-turbo V6 is more powerful than the Expedition’s, unleashing a bounty of low-end torque. Downshifts from the 10-speed automatic occur frequently, but are seldom bothersome. Paddle shifters and a tow/haul mode can be used. Gas mileage has shrunk, despite the updated powertrain. The standard-wheelbase rear-drive Navigator is EPA-rated at 16/23 mpg City/Highway, or 19 mpg Combined. The longer-body Navigator L alters that estimate to 16/22/18 mpg. With all-wheel drive, the Navigator is EPA-rated at 16/21/18 mpg. The all-new Lincoln Navigator delivers supreme comfort and overall quality. Sumptuous interior materials and finishes fill the vast cabin. There is plentiful space for passengers, even more so in the longer Navigator L versions. Driving the new-generation Navigator feels like a special occasion, a trait that’s been absent from recent versions.